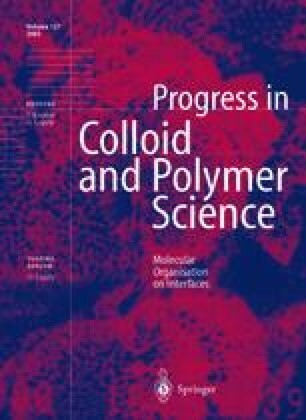 This article discusses the dynamical properties of homogeneous colloid—polymer blends consisting of hairy nanospheres and linear polymer chains, respectively. Two different model systems of hairy particles have been prepared: a system with comparatively short hairs off molecular weight below the entanglement regime, polyorganosiloxane microgels grafted with polystyrene hairs of molecular weight 13,000 gmol−1, embedded in polystyrene chains with molecular weight varying from 600 to 4,000 gmol−1; a system with comparatively long hairs of molecular weight above the entanglement regime, kinetically frozen copolymer micelles with a polystyrene core and polyisoprene corona chains of molecular weight 50,000 gmol−1, embedded in homopolyisoprene chains with molecular weight from 4,000 to 50,000 gmol−1. The effect of the particle topology, i.e. the molecular weight of the polymer brush hairs with respect to the homopolymer chains, on interparticle interactions has been investigated by dynamic mechanical measurements. The effective volume swelling ratio and particle softness as estimated from the dependence of the zero-shear viscosity of the blends with respect to the hard-sphere reference system are discussed for both systems.